Please select an option 9 13.5 12.5 12 9.5 13 10 14 8 6.5 11 6 10.5 7.5 11.5 7 8.5 Please select a ringsize. Great Workmanship On Brushed Matte Surface, Add on High Polish Smooth Inner Face, Bring You Both The Elegant and Comfort. Perfect 8MM Width, Suitable For Both Men And Women. 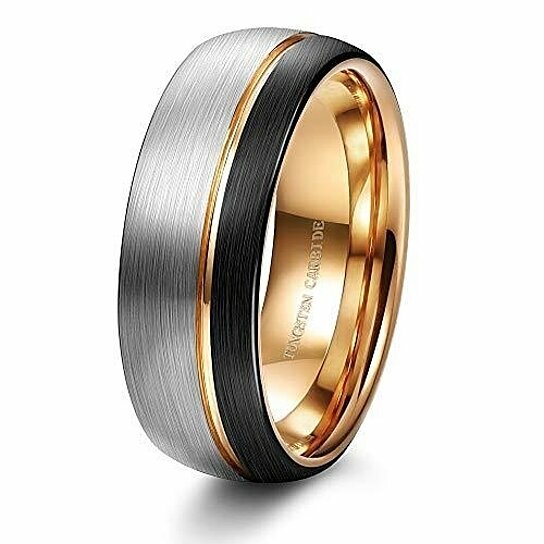 Tungsten Rings are Simple, Elegant, with Everlasting Shine Which Makes Them One of The Most Popular Choice for Practical and Stylish Couples All Over The World. Made Of Solid and Durable Tungsten Carbide, Scratch Resistant. This Ring Will Require Very Little Care. Rubbing with Any Clean Cloth Will Bring Out and Restore The Bright Finish, As It was on The Day You First Received The Ring. Comes in A Black Velvet Bag, Convenience to Store and Don't Worry about Lost Your Ring. Provide with Life-Time Guarantee. Just Check Below for More Details, and on How to Contact Us. Please Check Size Reference Images Before Ordering. Your Satisfaction is Our Unremitting Pursue!